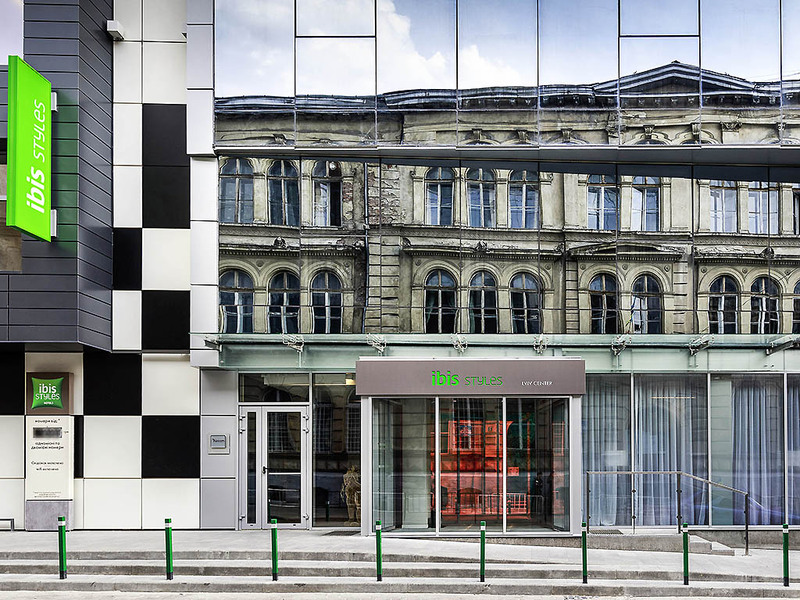 ibis Styles Lviv Center is a bright, modern and stylish hotel with perfect combination of Ukrainian national touch in small details and functional comfort. Hotel is ideally equipped to exceed expectations of both leisure tourists and businessmen. All rates include all-you-can-eat buffet breakfast and unlimited WIFI connection. Bedding quality is proved by world-known brand Sweet bed by ibis Styles. Conviviality area as well as kid's zone is available for guests 24 hours 7 days a week. Branded design hotel in downtown. 77 comfortable rooms with free WIFI and spectacular view of the old city. Complimentary tea, coffee and water in the lobby. Fresh all-you-can-eat buffet breakfast at Italian restaurant included. Warm, welcoming and modern, with a comfortable bed and a practical bathroom, our rooms offer everything you need for an enjoyable stay. Suite rooms accomplished with amazing city view from each room to ancient city center, sized up to 25 sq.m. Standard Double room with queen-size bed (200X160 cm). Room size 15,5m² to 20m². Standard Twin room with 2 twin beds (200X100 cm). Room size 15,5m² to 20m². Pizza Celentano Ristorante is offering wide selection of traditional European dishes with special attention to Italian cuisine. Upscale representative of Celentano family restaurants is focused on high quality of products as well as reasonable pricing. I have ordered an earlier check in. I missed a general equipment in bath room. I doubt there is only soap should be provided only. However I was charged per official rate. Also I was not able to check out later even I has been asked to come at reception in a few hours before checkout. I am a bit flustrated about overall process. If you have a room why this is an impression of service quality. Thanks for understanding. My family had a large amount of luggage which the security guard helped to bring in and out of the hotel and store securely overnight. All the staff were friendly, helpful and welcoming. Well situated a 10 minute walk from Rynok Square. !5 minutes walk from Ivan Franko Park where the tram from the airport terminates. Several trams stop directly outside the hotel. A shopping mall with a supermarket 5 mins walk. Complimentary coffee tea and bottled water at reception. TV has BBC world service. English spoken to a good standard. A typical Ibis in most respects. Very practical facilties, in the city center, and the person that work there are very kind, informed and gentle. The room was very tidy, so as the bathroom. And the view was nice. The front staff makes this a great place! After long work day, the front staff would personally greet me by name. They were always ready to help with anything. As you'd expect with Ibis, no frills but a very reasonably sized, comfortable room with a safe (always useful), with a nice TV, good shower and comfortable bed. What really stood out is the nice welcome and always friendly and helpful staff, and the excellent breakfast spread, of which some of the the hot items seems to change every day. There was a good selection of cereals, fruits, bread and hot items and it's surely the best breakfast I've seen for this price, in fact a decent breakfast for any price! Water, tea and coffee are available 24/7 from reception, so no need to buy water, which was extremely useful. It was nice to have a coffee in that area as it had some comfortable seating. Would definitely stay here again, it's a great location a 5-10 min walk South of Rynok Square, and overall it was a very enjoyable experience. Hotel is new, comfortable and clean with great location in the centre of Lviv. Stuff was friendly. Breakfast was excellent. Excellent service and reception. In winter conditioning is working as heating only, so no chance of fresh and not hot air in the room where window doesn't open. Stayed in the hotel during business trip in Lviv. Comfortable quiet rooms, very friendly staff always ready ti help with smile on the face. Breakfast tasty, really enjoyed. Funky, friendly, spotlessly clean in a perfect location. We had a fantastic experience staying here. Everything from the airport pickup to the breakfast was superb. Staff were friendly and approachable. The rooms were clean, comfortable and spacious. We would definitely stay here again.